Do you have a minute to spare to learn some English? 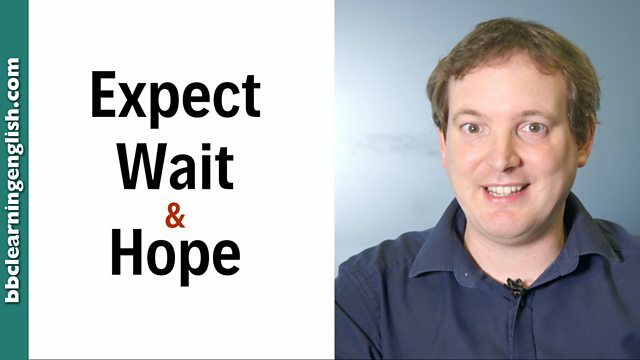 Phil explains the differences between hope, expect and wait. Give us 60 seconds and we'll give you the English! Hi! I'm Phil from BBC Learning English. Today, I'm going to tell you the difference between expect, wait and hope. They all talk about things in the future, but they don't mean the same. We use expect to say that we think something is likely. It's raining today, so I expect the traffic will be really bad. When we talk about time passing, we don't use expect, we use wait. I'm waiting for the rain to stop. When we talk about wanting something to happen, we don't use expect. We use hope. I hope it will be sunny tomorrow. So just remember: You expect what's likely. Wait for things that take time. And hope for things that you want to happen. I expect you knew that, but I hope you'll practise it. I'm waiting for you to start... go on! We use expect to say that we think something is likely. Expect can be followed by a full infinitive, an object or a that clause. I expect to arrive by 4. I expect you to clean your room. It's raining today, so I expect (that) the traffic will be really bad. We use wait when we talk about time passing. Waiting is often physical. We sit or stand somewhere until something happens. Wait is often followed by the preposition for or a full infinitive verb. I'm waiting for the rain to stop. We use hope when we talk about wanting something to happen. We would like it to happen, but we don't know if it will. Hope can be followed by the preposition for and an object, a full infinitive or a that clause. Never give up. You have to hope for the best. That was fun. I hope to see you again soon! I hope (that) it will be sunny tomorrow. Which verb can't be followed by a 'that' clause? One of the verbs doesn't fit here. "Every day I ______ for freedom," said the prisoner. Which option is incorrect? Which verb makes the most sense here? Complete this sentence: I ______ to be famous one day, but I have no idea if I ever will.